The inaugural “Boo Run” was hosted by local non-profit The Creative Living Room. 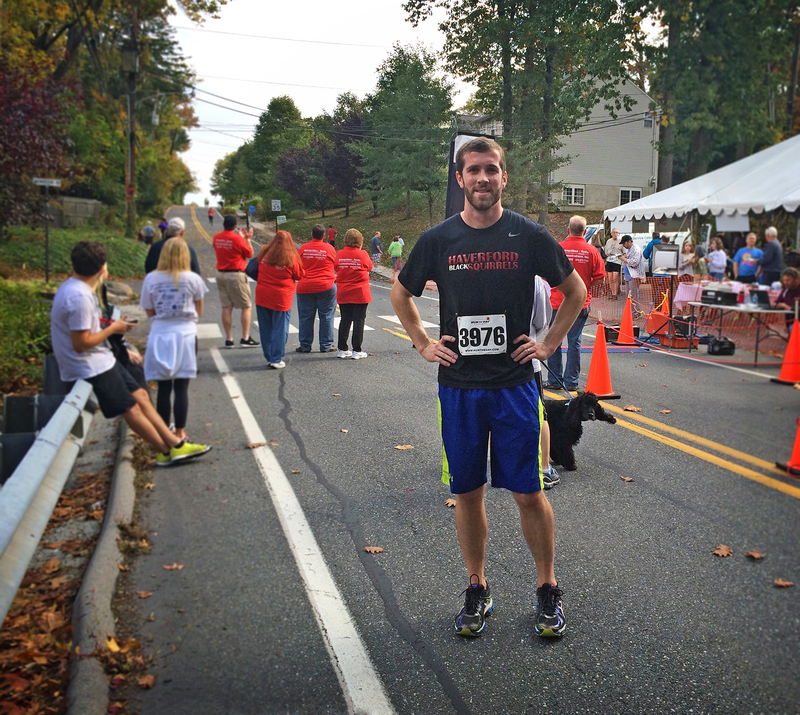 The 5K course differed from any other race I’ve done in Wallingford and I thoroughly enjoyed its many twists and turns. The race began on a flat stretch of Plush Mill Road, passing Pendle Hill (a Quaker retreat) before veering right onto a section of the Leiper-Smedley Trail that was blanketed in colorful fall leaves. The course then plummeted downhill on Rogers Lane (mimicking the finish of the Fueled Up 5K) before turning right onto a loooong uphill section of Turner Road that lasted for most of the 2nd mile. After a quick loop through a neighborhood and a little downhill the race finished back at The Creative Living Room in the middle of a mini festival with sponsor tents, food, kids’ games and music. I attempted to follow this plan and repeated that mantra to myself multiple times during the race. Running with my heart during mile 3. I often go out too fast in the first mile, so on Saturday I tried to use my head and worked hard to stay at a slow, steady pace that didn’t feel too hard. I chose not to look at my watch for the first split because I didn’t want to spend mile 2 overthinking how fast or slow I went out. If I had looked, I would have seen that mile 1 was over in 7:37. As soon as mile 3 began I told myself to relax and just give the end of the race everything I had left. At that point I was pretty sure that I was currently the first place female on the course. If that was the case I certainly didn’t want to get passed in the last mile so I pushed myself hard, only glancing back once at a turn to confirm that no one was right on my heels. The finish line finally came into view along with a big surprise… the clock was in the mid-23s!! I happily crossed the line as the clock struck 23:41 and was thrilled when the race timer told me I was indeed the first place woman. Woohoo! After the race when I checked my final split I did a double take… apparently I ran the last mile in 7:31!!! That’s my fastest final mile ever (tied with Brian’s Run, to be precise) and one of the only times that the final mile has been my fastest of a race. Cool! My next race is tomorrow’s Trinity 5K, where I will once again try to apply the head-focus-heart mantra to my run. Trinity ends with a giant uphill in mile 3 so I don’t think I’ll be running a negative split, but hopefully I can put down a good 5K time for the second weekend in a row! Double OyVey 10K Recap and a New PR! “A” Goal: Sub-50. Again, I had no idea what I would do in a 10K but this seemed like a challenging goal, much like the sub-25 minute 5K time that I chased down during my first year of racing. “C” Goal: Beat my previous 10K PR of 58:34. 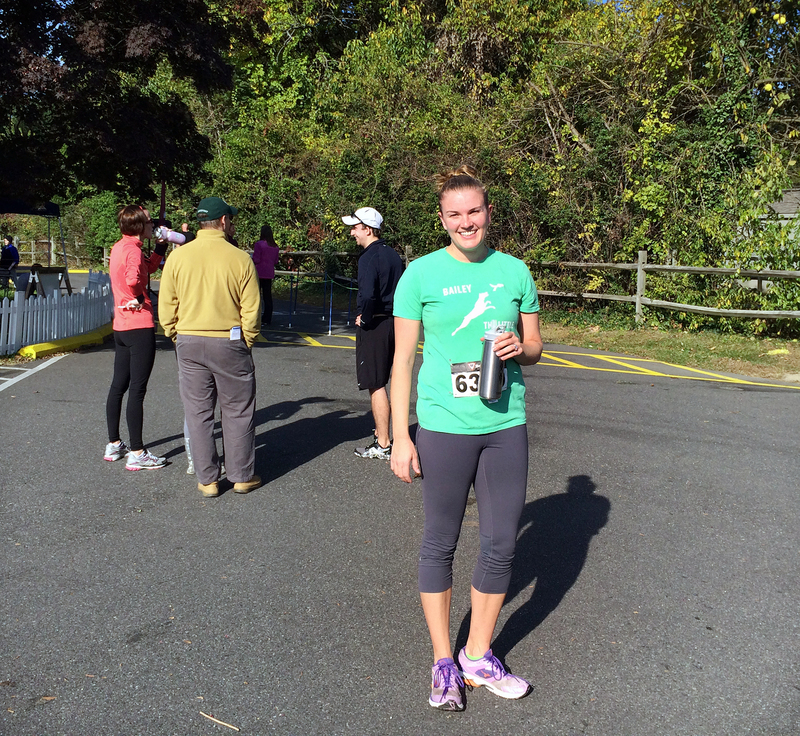 My old PR was set on a hilly trail course at the Tyler Arboretum back in April. If I can’t beat this time on the road something is wrong with me! Spoiler Alert: I finished in 49:50!!!!! 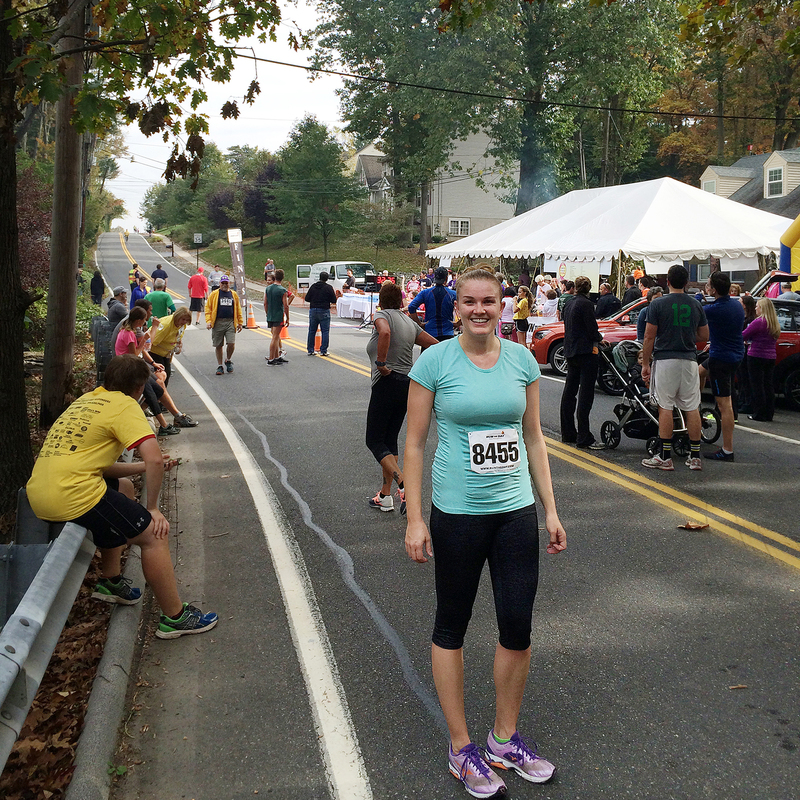 Sunday’s Double OyVey 10K was hosted by Ohev Shalom Synagogue in Wallingford, PA. The race began at 10AM and I started off conservatively with a relaxed first mile split of 7:52. Just after mile 1 the 10K runners veered off from the nice, flat 5K course (a course that I PR’d on back in 2013!) and plunged down a steep hill onto Avondale Road. We wound around on Avondale for a mile or so, passing under the Blue Route (I-476) and by the Thomas Leiper House. Mile 2 beeped by in 8:04. We eventually emerged out of the woods and onto quiet neighborhood streets, where the course proceeded to climb, and climb, and climb. Up up up! At the top of the hill my watch finally reported that Mile 3 had taken me 8:41 to complete. I glanced at my watch to see my 5K split and was dismayed to see 25:16. That sub-50 goal was looking less and less attainable. Nevertheless, I knew I had a lot of downhill ahead of me and I was pretty sure that I was currently the first place female on the 10K course. I ran on, trying to keep up my cadence and carefully watching for the white arrows on the road that would indicate my next turn. Mile 4 clicked by in 8:06. Not bad, but the course’s steepest hill awaited me on the climb back up Avondale Road to 320. This climb felt HARD and I focused on putting one foot ahead of the other while listening to Daft Punk’s “Get Lucky” — isn’t it funny how you remember some songs so clearly during a race? Mile 5 beeped by in 8:38, with a total cumulative time of 42:26-ish. If that time was correct I was way off my sub-50 goal and running even slower than my Media 5 Mile race from June. This was disappointing, but I knew that my watch was somewhat off as it hadn’t been lining up with the mile markers that I saw out on the course. I pushed on, telling myself that I only had one flat mile to go. At long last I reached Rt. 320 and took the left turn into the Synagogue’s parking lot. The race organizer passed me in the final seconds and I attempted to pick up my pace to stay with him… but mostly I was just relieved that it was a man – not a woman – who was passing me right at the end! I felt my watch vibrate for mile 6 but didn’t bother to look because I had just spotted the finish line clock. It was ticking away at 49:40! Up until that moment I did not believe that sub-50 was within reach, but when I saw the clock I started sprinting for the finish, eager to earn my shiny new PR. I crossed the line in 49:50, first female and third overall in a very small field of 10K runners. Overall the Double OyVey 10K was a great race with very friendly people and a low-key, relaxed vibe… AND a cool name! 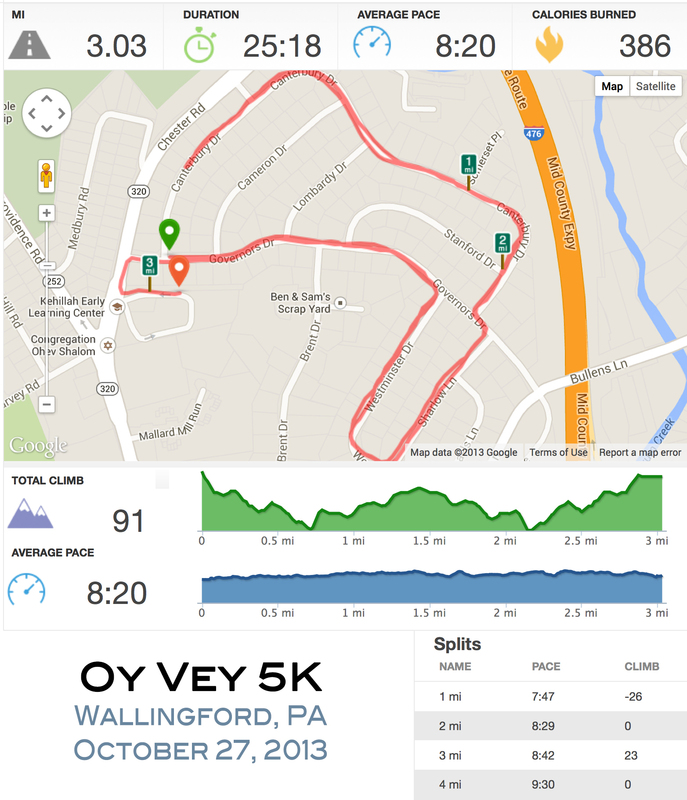 The course was certainly not easy, but 10Ks are rare in the western Philadelphia suburbs and I was very happy to finally get a chance to race this distance on a road course. 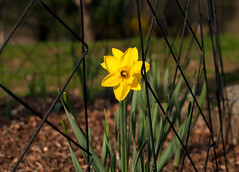 Now I’m looking forward to the mental boost that Sunday’s race will give me when I return to a “mere” 5K next weekend! And… drumroll, please… 150 gallons of heating oil from the event’s main sponsor, Wilson Oil!! The race itself was pretty exciting too. Last year’s Fueled Up 5K was my second race and I remember being so excited afterwards because I finished the race without walking (a big feat at the time!!) and I got a then PR-time of 26:51. I knew going into today’s race that I can now run much faster, but I was curious to see how different my race and splits would be after 12 months of running. Here’s a side by side comparison of last year vs. this year’s race! I ran almost 3 minutes faster this year and finished with another sub-24 time (!!) of 23:56. Woohoo! As you can see in the stats above, I went out really fast but the first mile also had a huge downhill so that 7:16 pace felt surprisingly comfortable. Matt and I passed one another a few times during the second mile as we wove through relatively flat neighborhoods, but then I pulled into the lead for good at the 2 mile marker, just before we entered the woods for the long climb up the paved Smedley-Leiper Trail. Matt finished 13th overall and 2nd in his age group with a 24:46. My 23:56 finish time was good enough for 3rd place female and 1st in my age group which reminds me… I only have one more weekend to go before I join the 30-39 age group!! I turn 30 on November 1st so I better have a good last race in the 20-29 AG in next Saturday’s Bark in the Park 5K. 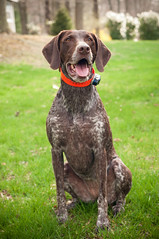 As the name implies, the Bark in the Park is a dog friendly event so I will be borrowing Bella the GSP to run with me. 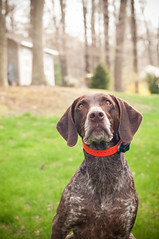 I’m looking forward to having a 4-legged racing buddy! 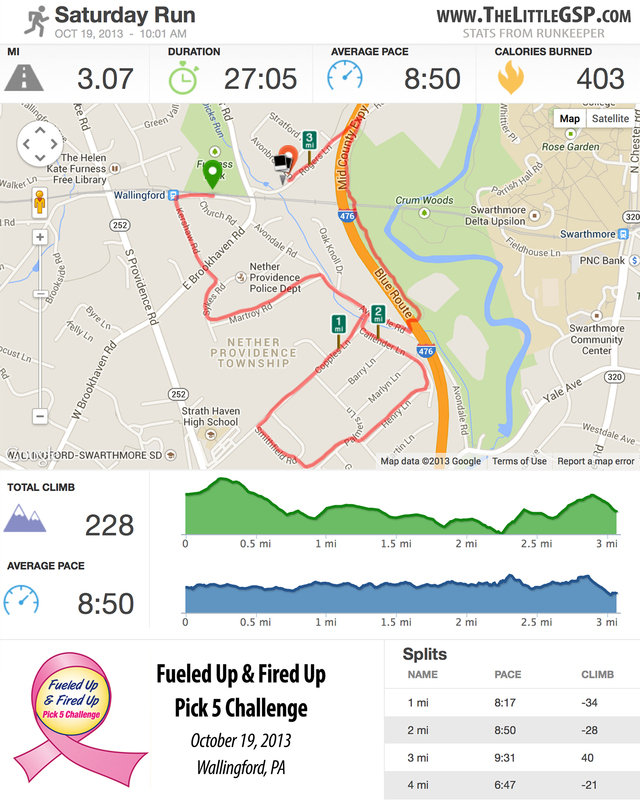 On Thursday evening Matt and I finally got to participate in a “Pickle Run,” one of a series of prediction 5Ks hosted by our awesome local race timing organization, Run the Day. 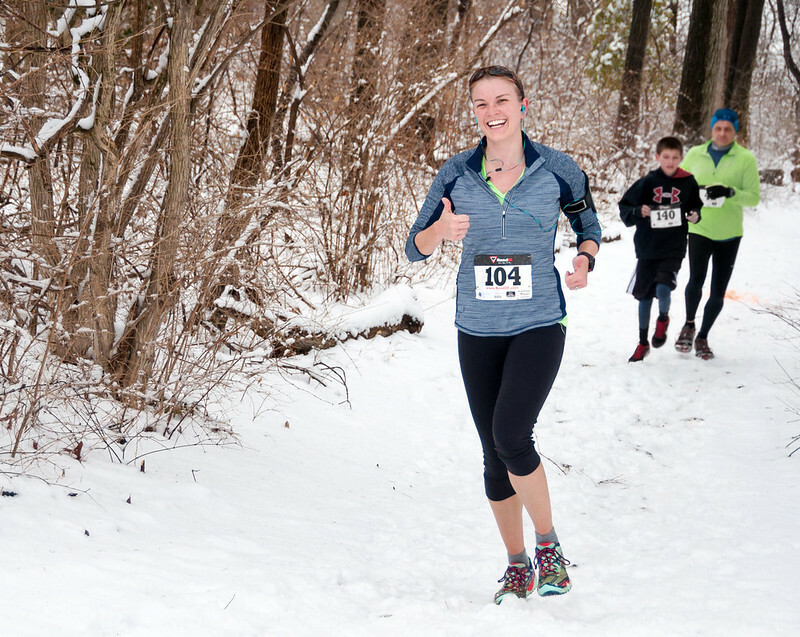 We tried to race in a Pickle Run in February but we were thwarted by the Ice Storm, and then we were signed up for another in March but I goofed and showed up for the start 4 hours late (we ended up running the race anyway and dubbed it the Un-Pickle Run). Luckily history did not repeat itself a third time on Thursday because — spoiler alert — I ran a HUGE PR!!! 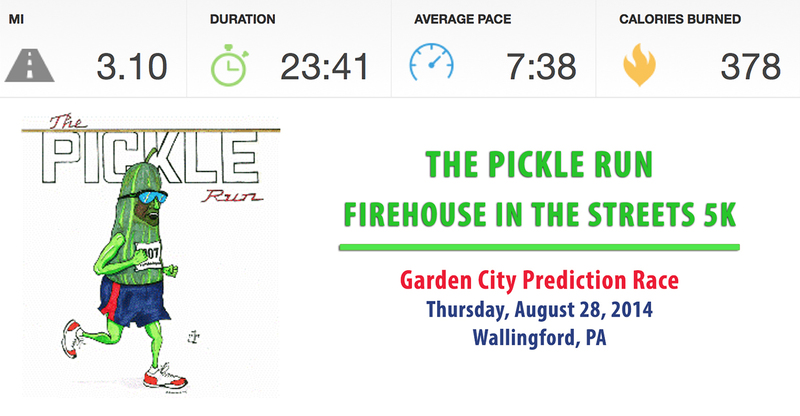 This edition of the Pickle Run was dubbed the Firehouse Pickle in the Streets 5K and it was hosted by the Garden City Fire Company in Wallingford, PA. Since this was a prediction race, all of the participants guessed their finish times in advance and ran the race without any timing devices. The “winner” wasn’t the fastest runner, but rather the one that guessed closest to their actual completion time. 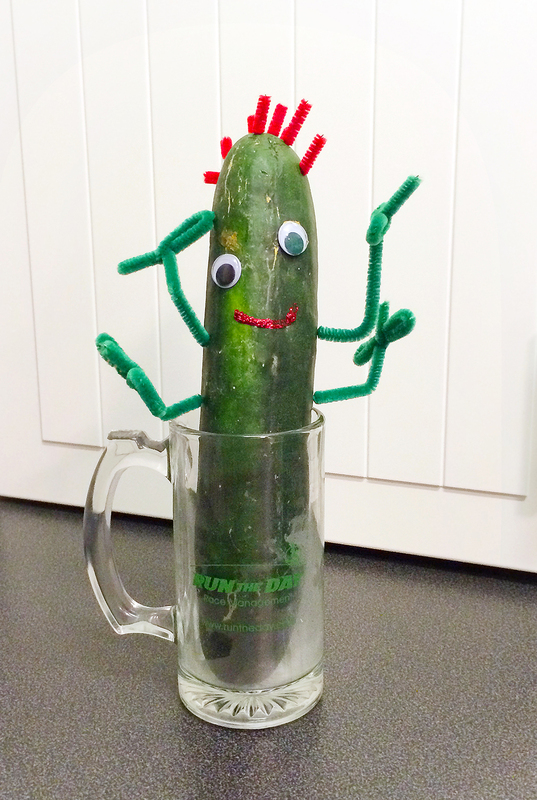 I think this is a really fun idea and I’d definitely do a Pickle Run again in the future! The race itself had about 100 participants and the course wound through the gloriously flat, quiet neighborhoods around the firehouse. The first mile seemed slightly downhill and I went out FAST, thinking to myself that I better take advantage of that downhill while I could. (Somehow it never felt like we had any uphills to make up for that downhill, but hey, I’m not complaining!) I didn’t have RunKeeper telling my my splits so at points I felt a little disoriented in terms of how far along in the race I was and how fast I was going. 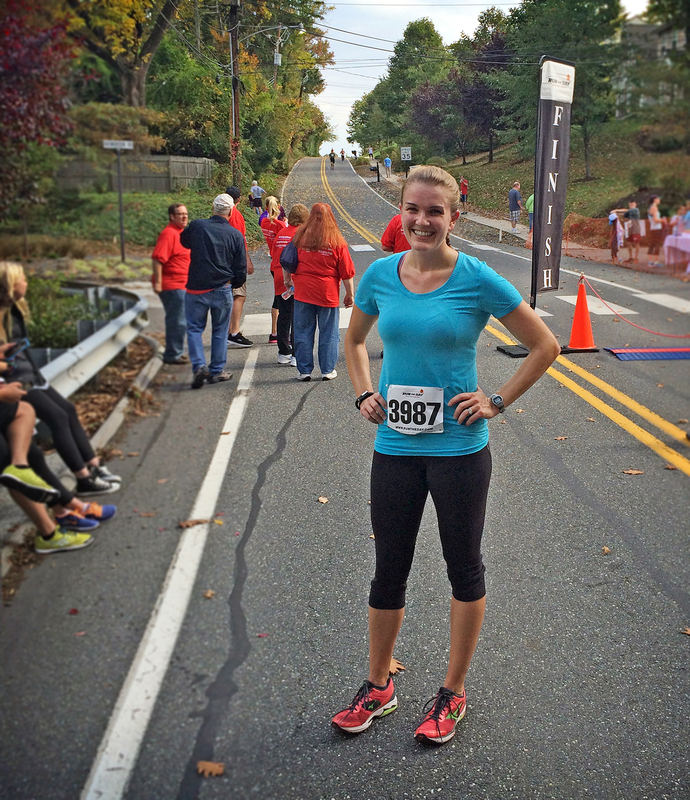 I really wanted a PR so I kept pushing myself to keep up my pace (whatever that pace was…). The last thing I wanted was to feel like I let up at some point in the race only to find out that I missed a PR by a few seconds. I’m thrilled to have run a sub-24 5K, but I’m pretty sure that the faster time was not an accident. I’ve been doing weekly speedwork at a track with a local running group and, quite frankly, I would have been a little disappointed had I not run some sort of PR. The speed workouts are really challenging but it’s great to see that the time spent on the track is clearly having an effect on my running. Can’t wait to see how I’ll feel after a few more weeks of training during my next race, Willistown Conservation Trust’s Run-a-Muck on September 20th. Run-a-Muck was my first race ever last year and I’m hoping to run significantly faster this year! Matt and I ran our second 5K race in as many weekends this morning. The race had a great name – the “Oy Vey 5K” – and, just like last weekend’s race, it took place in Wallingford, PA. 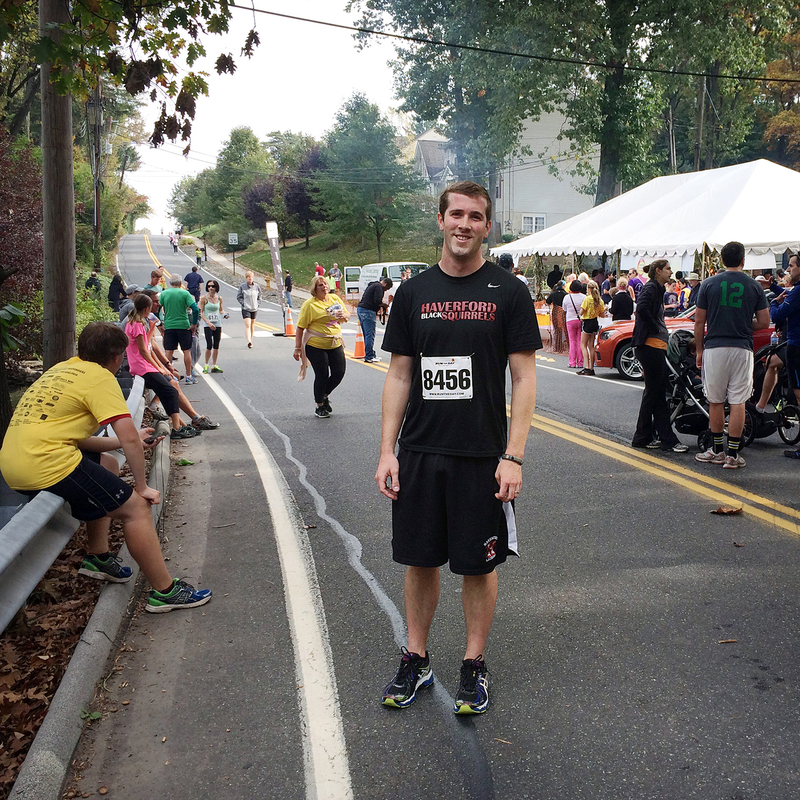 I had two goals going into this race: #1 – run faster than last week’s 26:51 time and #2 – finish in under 26 minutes. And guess what?? I did both!! My official race time was 25:16 which is a huge PR for me – even better than my best time from high school. On top of that I was the first female finisher of the race! The Oy Vey 5K was hosted by Congregation Ohev Shalom. We parked at the Synagogue, walked a short distance into nearby neighborhoods to the start line, and raced on a nice flat out-and-back course. The race finished back at the synagogue where they had food, water, and raffle prizes for everyone. All in all a great morning! Matt was the 7th finisher overall with a time of 24:21 (faster than his time of 24:52 from last week). I was 8th overall and only about a minute behind Matt the whole race which meant that I could see him most of the time. Matt didn’t know how close I was until we go to the halfway/turn around point and then he realized that I was right there behind him and he cheered me on. Woohoo! I did have one technological glitch during the race. My running playlist started off as usual with Lady Gaga’s Bad Romance but then, to my horror, I realized that my phone was set to repeat that same song over and over and over again… oh no! I contemplated trying to fiddle with my iPhone while running (or maybe trying to talk to Siri and get her to fix it??!) but I eventually gave up and just listened to a LOT of Bad Romance. 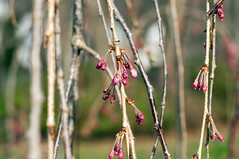 I think I need to remove that song from my playlist for next week – I’m sick of it! Here’s RunKeeper’s summary of today’s race. As usual, the finish time and distance are a little off. I guess I’d rather have my phone telling me that I still have another .2 to go and then actually be done rather than the other way around though, right? I almost forgot to mention… with 1.3 miles left to go in the race I hit 500 miles!!!! I’ve been running since July 18th and I’ve had a blast. Here’s to the next 500 miles! Another 5K in the Books! Matt and I ran another 5K this morning and it was fun!! 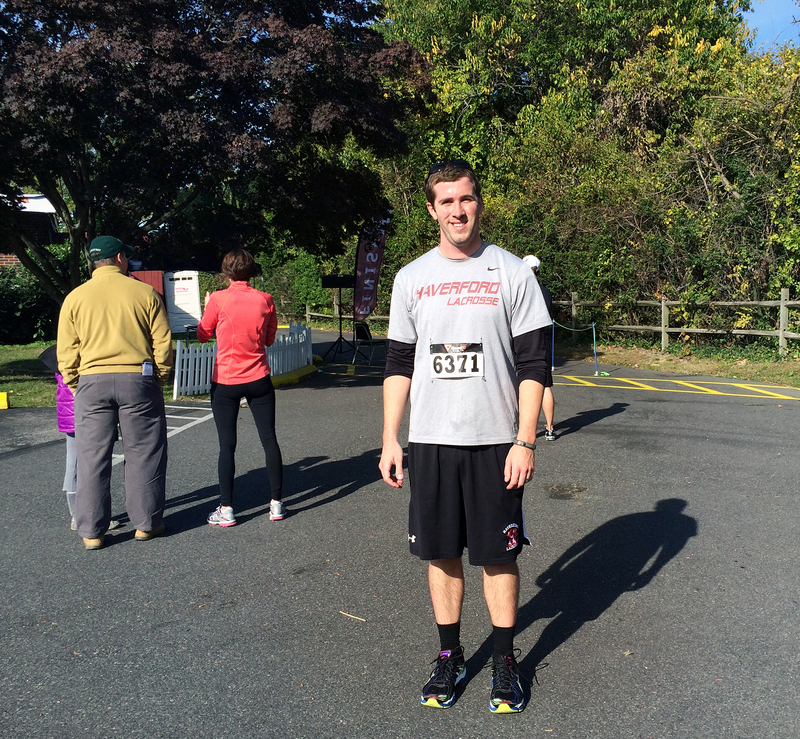 I had two goals going into the race: #1 – Don’t walk and #2 – Finish in under 30 minutes. Not only did I run the whole thing, I finished in under 27 minutes!! I’m still surprised! The “Fueled Up & Fired Up Pick 5 Challenge” race took place in Matt’s hometown of Wallingford, PA and was sponsored by Wilson Oil & Propane. We started at the Wallingford train station and wound around neighborhoods for two miles before tackling the hilly Smedley-Leiper Trail that parallels the Blue Route (I-476). Thankfully, the race finished with a nice downhill towards the Wilson Oil parking lot. Matt was the 7th finisher overall with a time of 24:52 and I was the 4th female to cross the line with a 26:51. We both ended up first in our 20-29 age group which was kind of cool. Granted, there were only a few people in our age group and the entire 5K race only had 67 entries, but I was still pretty excited! Here’s RunKeeper’s summary of today’s race. (The finish time is a bit off because I was late hitting the stop button.) The hills in the Smedley-Leiper trail definitely hurt my pace in the 3rd mile but overall this was much faster than I was expecting. Here’s my latest mile tally. Many of these miles were done on the elliptical due to my sore foot but it seemed that cross-training worked because my foot feels a lot better now! Our next 5K is next Sunday and then we’re entered in another one the following Saturday. Go big or go home, right?